View the DCI Minnesota recap. Saturday, July 13, saw all World Class corps compete at the DCI Minnesota presented by DeMoulin Brothers Premier Event at TCF Stadium in Minneapolis, except those yet to join the full DCI Tour including Pioneer, Jersey Surf, Pacific Crest, Mandarins and Oregon Crusaders who will all compete next Saturday in San Antonio. The top seven corps all broke 80 points and only 2.15 separates 4th place from 1st. Despite it being mid-July, there are four weekends left in the season, and a lot can happen in that time. Two years ago, the corps that placed 4th at this show went on to win the World Championship title. In reading the following, please keep in mind that the scores of the two General Effect (GE) captions are counted for full value, but each of the scores of the three Visual and three Music captions are first divided in half, with each of those half scores then added for the Total Visual and Total Percussion score. View the complete recap of scores from this event. Carolina Crown (1st, 86.00) won General Effect by a solid 0.50, 0.25 in both Visual Effect and Music Effect. Those two captions alone account for more than the total spread over the Blue Devils. The spread over BD in Visual was a scant 0.05; the corps placing 1st in Visual Proficiency, 3rd in Visual Analysis and 2nd (by 0.10) in Color Guard. In Music, Crown was 1st in Brass and Music Analysis, but 5th in Percussion, 0.70 under BD's line. However, since that score is divided in half, the deficiency to Devils is 0.35. Being down 0.10 in Total Music is more than offset by that large spread in General Effect. Blue Devils (2nd, 85.55) won Percussion by 0.10 over Cadets and 0.20 over Santa Clara Vanguard (Bluecoats were 4th.) Color Guard also placed 1st, 0.10 over Crown. In all General Effect sub-captions, the corps took 2nd to Crown, and was also 2nd to Crown in Visual Proficiency, Brass and Music Analysis. A 2nd place was earned in Visual Analysis, 0.10 under the Cadets. The Cadets (3rd, 84.45) took 1st in Visual Analysis, 2nd in Percussion, and third in both GE captions, Visual Proficiency and Brass. Color Guard and Music Analysis both placed 5th. 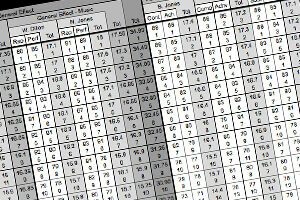 The combinations of all the captions resulted in the corps taking 3rd in Total GE, Total Visual and Total Music. Santa Clara Vanguard (4th, 83.85) was 3rd in Color Guard, Percussion, Music Analysis and Color Guard and 4th in all other captions. One Visual Effect judge had the corps in 5th, but the 3rd place finish from the other judge offset that score. Phantom Regiment (5th, 82.00) was 4th in Color Guard and Music Analysis, 6th in Brass and Percussion and 5th in the remaining four captions. Bluecoats (6th, 81.30) took 4th in Percussion and 5th in Brass. Visual Effect and Color Guard was 7th, with the remaining four captions placing 6th. Down 0.50 to Regiment in Total Visual accounted for most of the spread between those two corps. Madison Scouts (7th, 80.15) ranged from 6th in Visual Effect and Color Guard to 9th in Percussion. Music Effect, Brass and Music Analysis placed 7th. Visual Proficiency and Visual Analysis both took 8th. The corps was 7th in all Total captions. The Cavaliers (8th, 78.60) placed 7th in Visual Proficiency and Percussion. Color Guard took 10th, under Blue Knights and Boston Crusaders. Music Effect and Music Analysis finished 8th, with the three remaining captions in 9th, with one of the two Visual Effect judges placing the corps in 11th. Blue Knights (9th, 78.10) was 8th in both General Effect captions and Color Guard, allowing the corps to edge Boston Crusaders. Brass was 11th. The remaining four captions all finished in 10th. Boston Crusaders (10th, 78.05) was 7th in Visual Analysis and 8th in Brass and Percussion, and 9th in Visual Proficiency and Color Guard. The corps fell to Blue Knights mostly due to a 10th place finish in Music Effect and 11th place finishes in Visual Effect and Music Analysis. The Visual Effect was the main culprit, with the 0.70 drop to BK in Visual Effect accounting for far more than the spread between the two corps. Spirit of Atlanta (11th, 75.45) took 10th in Visual Effect, their highest caption. The corps took 11th in Music Effect (a tie with Blue Stars), Visual Analysis and Percussion, with the remaining four captions finishing in 12th. Blue Stars (12th, 75.35) took 10th in Brass, 12th in Effect Visual, 13th in Visual Analysis and 14th in Music Analysis. The other four captions all placed 11th. A 0.60 spread under Spirit is the main reason Blue Stars finished in 12th and not 11th. Troopers (13th, 73.40) were 12th in Visual Proficiency and Visual Analysis, 14th in Color Guard and Brass and 13th in the other four captions. Crossmen (14th, 73.30) was 9th in Music Analysis and 13th in Visual Proficiency, Color Guard and Brass. The other four captions finished 14th. Colts (15th, 70.90) took 14th in Visual Effect, 16th in Brass and Percussion and 15th in the remaining five captions. The Academy (16th,69.10) was 15th in Brass and Percussion, 17th in Visual Analysis and 16th in the other five captions. Cascades (17th, 61.00) was 17th in all captions except for 16th in Visual Analysis. In Open Class competition, Music City (1st, 68.40) was 1st in Visual Analysis, Color Guard, Brass and Percussion and 2nd to Legends in everything else. Legends (2nd, 68.05) took 1st in both Effect captions, Visual Proficiency and Music Analysis, and placed 2nd to Music City in all other captions. Racine Scouts (3rd, 54.80) was 3rd in all captions. In the All-Age Class, Govenaires scored 69.275. Minnesota Brass performed in exhibition and therefore did not receive a score. View the complete recap of scores from this event.